After AFC Fylde’s version of a mid-season break, the season goes to the opposite extreme tomorrow. They have had two weeks on the sidelines while seeing their nine-point lead preserved, but now comes a sequence of three matches in the space of a week. It begins with a visit to FA Cup battlers Curzon Ashton tomorrow, followed by a home fixture against Alfreton on Tuesday and another Mill Farm fixture versus Altrincham tomorrow week. Manager Dave Challinor said: “It has been a good couple of weeks, but now it is back to work. “Chorley’s match against Boston last Saturday was called off, so they didn’t make any ground on us. Curzon go into the match in 16th place in the National North table, but they came to national prominence with their FA Cup exploits against Wimbledon, moving into a 3-0 lead before the League club fought back and ultimately won 4-3. Not only has the break for a fortnight given Fylde the chance to regroup, it has also given time for an ankle injury to free-scoring Danny Rowe settle down. He has scored 32 goals in the league so far this season, but has recently hit what can laughably be called a lean spell – he has not found the net for three matches. Not that it concerns Coasters’ boss Challinor unduly, if at all. He said: “In two games when Danny has not scored, we have scored three. “If there are two players marking him in a game, then it will give other players more chance to exploit the extra space. Curzon will have popular striker Matty Warburton in their squad. He has returned to the club after a spell with Salford City, where his contract has been cancelled by mutual consent. 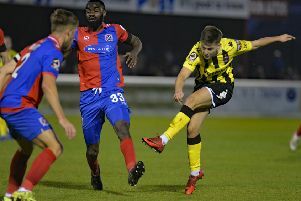 Warburton has proved himself a prolific scorer for Curzon in the Evo-Stik Northern Premier League First Division North and the NPL premier division. His overall scoring ratio is only slightly less than a goal every other game.